Ready to get out of the cold and into some soothing rays of sunshine. Book a cruise to see more of the world. The benefits of going on a cruise out way many of the options to just fly to one destination. Being able to visit multiple destinations gives You a variety and an in depth experience if you wish to go back to that spot. If you have safety concerns at all they are extremely safe. They go over and practice safety precautions all the time. Aboard the ship they have life boats just in case if ever there was an emergency. It is very cost-effective way to travel also with it being all inclusive. A big reason Cruisers cruise is the 24-7 all you can Eat at your finger tips. There are endless culinary choices to choose from. Entertainment comes in the form of comedic, gameshows, live shows and theatrical talents . You and your family have options and if it is a night out without the kids you want there are many targeted age specific groups of entertainment that will keep your kids having fun. You have your own very cabin steward the whole time you are on your cruise. They take care of You and keep your cabin clean. They keep you up to date on upcoming activities and shore excursions when you port. They tend to also leave you the famous towel animals in your cabin. That is my favorite part. I have been on many Cruise ships that have almost anything you can think of from bowling alleys, mini golf, rock climbing, flo riding, shopping and even doing a little gambling. Gyms and fitness classes are a norm on a ship. If you are looking to pamper yourself you can do just that with the spas on board. Now finding a ship that meets your desire of vacation is easy. There is a difference in cruise ships. I have had the opportunity to go on multiple ships myself. They are generally the same except for food, activities and size. I love the Flo rider and so I would choose a newer Royal Caribbean ship over another one. It is a surf simulator on the ship that allows you to catch some waves. I also love the wide variety of food options on the Norwegian. They also have wider hallways and my favorite all you can eat crepes. Just being on the ocean is relaxing for me and knowing tomorrow i will Be on another island is exciting. There are others that might be against cruising, but I feel it is something you need to decide for yourself. I wouldn’t call myself an expert but just know what I like when I cruise now. My most recent cruise was on the Norwegian and we went stopped at 4 different ports. The food was top notch with unlimited buffalo wings daily to all you can eat crepes at night. There was a variety of ethnic foods to be adventurous and try out. Ice cream, sherbets and gelato. I felt like I was on my own Willy Wonka Factory. They also have other restaurants if you want to pay extra for a on site 5 Star dining room experience. I also was able to test my skills on a rope course and find myself climbing to the top of the ship. I battled for the castle in a larger than life chess set and shot baskets to my hearts content. Like I said there are many activities that you will discover and also many new things you will try aboard. Parents you will not hear those famous words from our kids “we are bored” … the kids can roam about with groups of kids their age in coordinated activities. 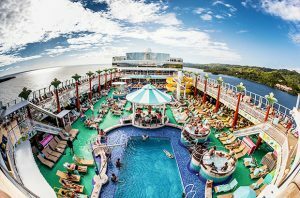 Large splash parks, water slides and pools will keep you cooled down on the ship. Capturing those moments, well leave it to the on board photographers that are out and about taking pictures with your permission of course and developing them in the photo gallery to purchase. If you and your partner want to get all dressed up and go to dinner then you can if not it’s beach attire everywhere. The choice is yours. Going on vacation can be hard at times if you want to make sure there is something for everyone. Going on a cruise will take care of just that for you. There is literally non stop entertainment, activities and food available around the clock. If you also want to be low key too take a nap in the sun or lounge in your cabin. The choice is yours. They also have movies available on the big screen and if you missed out on a live game show they generally replay it on your tv on the aboard channel. Room service is also offered around the clock. Dance clubs from 80’s, salsa, jazz etc music from every genre. Not too much of a rump shaker than test your vocal cords out in a karaoke bar or battle your partner in a lip sync show. Get out of your comfort zone and experience everything they have to offer. Some of the ports you visit are owned by the cruise lines. The cruise lines sometimes buy land and develop the area and have the natives work and create jobs for the locals. This helps stimulate their economy bringing in money and growth. Around 90% of the employees or more on the cruise ship come from all over the world. Our Captain was from Sweden while our chef was from India to events coordinator from Norway and housekeeping from China. Their contracts go from anywhere to 6-9 months then have 3 or more months off then back in the ship. They can work up to 70 hours a week. There seems to be a longevity history to their employees and a lot of opportunities to promote. If you still aren’t sure about cruising, the best thing is just to book a cruise and figure it out yourself. One more thing if you think you will get sea sick there is a lot of alternatives to help. A helpful one is called sea bands they are just bracelets that actually work. They put just enough pressure to put you at ease on your wrist.